Yay or Nay? If anything, specs, and price are really good. What is LOA, beam, power, etc.? 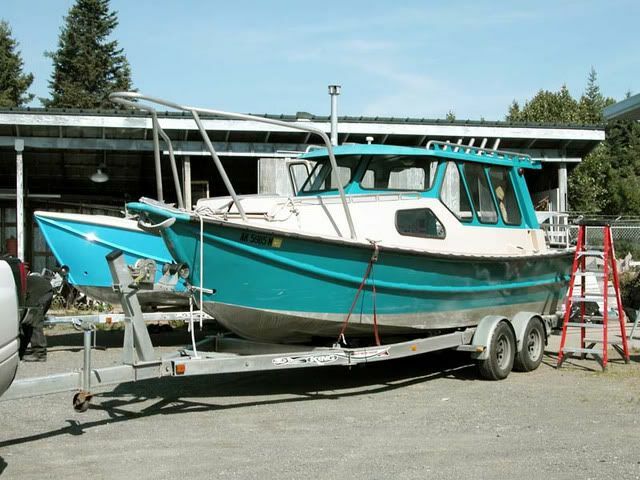 22ft exact, 8ft 6inch width, tested with 150HP Fourstroke. 2 people with 1/2 tank fuel topped out at 38 knots @ 2.9MPG on GPS. Anyone know other boat with same size and engine that does the similar speed and mpg? just curious here. MCNMachine, I'm a traditionalist in regard boat design, I'm all about curves in boats. 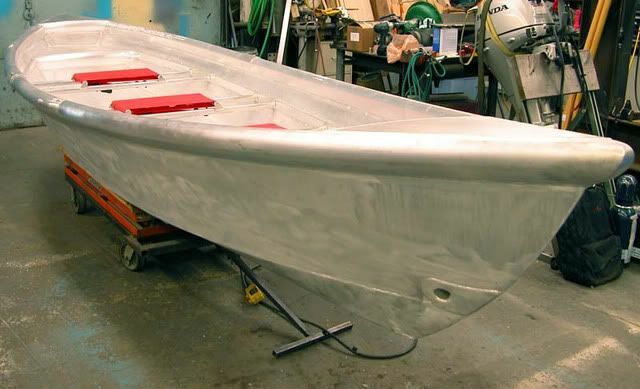 Having built a few welded boats and worked my overly round stern off to achieve curved shapes (not having plastic deforming equipment) using flats, cylinders and conic forms of sheet metal- I'm more inclined to the difficult task of creating rounded forms over the more "industrial look". Almost all of the forms I see here, with the exception of a chine curve peaking out of the water? , seem be be the result of a press brake. So I tend to look to other designers' work because this type of form is "faceted" not curved. Several builders are working in this form type- and way too many weather helms, dog houses, pilot houses and other cabins are designed using facets or bent plate panels. I personally find the result unattractive and somehow more agricultural than marine. However, there's not accounting taste- and the old saw "Beauty is in the eyes of the Beholder" applies to boat designs as much as it does to all other design. Some like the 'hummer'/modern jeep form http://www.hdcarwallpapers.com/2017_hum ... apers.html while others prefer the older and classic swept fender lines of the Bugatti http://cfgfactory.com/downloads/show/51d24d33af7b2. My point is that the boat shown is of the newer and more 'gunboat' industrial look - while I'm in the old school preference of long sweet curves. I have trouble with the OZ designs in a similar manner: I like the cabins farther (proportionally) aft but the 'best use' of the LOA is to crowd the cabin forward- but I just don't care for the look of that form. 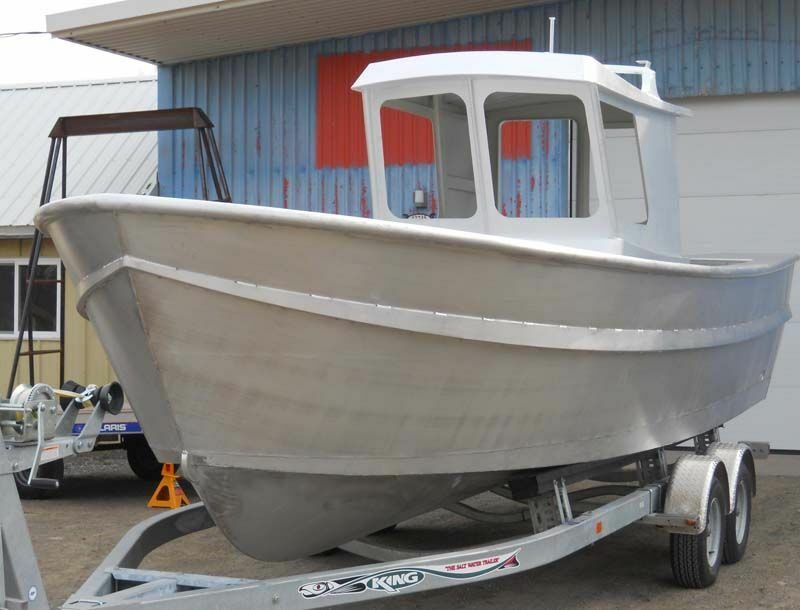 Below are some of my skiff projects over the last decades, posted to show what I consider important in design of welded aluminum boats. 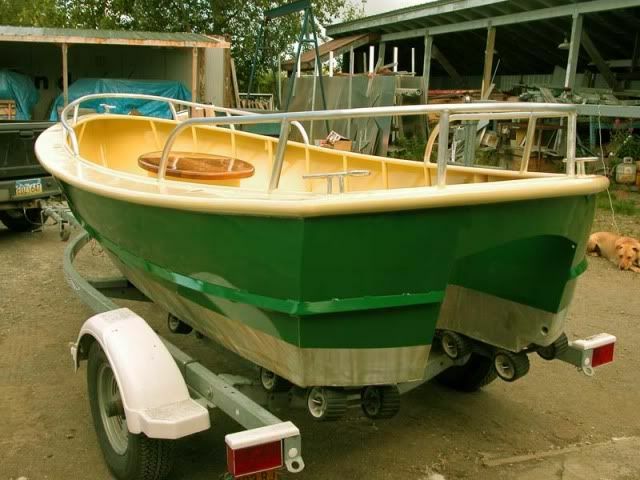 When I draw a skiff or build one, I work hard to get curves that are sweet and fair, perhaps not important to others? but to me? Those curves are critically important so I'm not inclined toward boats where their curves are given up for the press brake's bent panels. Two more cents in the discussion of welded design; just my remarks on the look of the shape in your post: too many straight lines for my tastes. But being made of the Miracle Metal-she may well perform reliably, and if well maintained, be in service for many years? Last edited by kmorin on Mon Jan 16, 2017 2:52 pm, edited 1 time in total.